Includes power cord, screws, bag and a mountain of cables. 140mm Double Ball Bearing. Fan Size / Bearing. TUV, CB, CE, FCC, RCM, cTUVus, BSMI, CCC, WEEE, RoHS. 85mm (H) x 150mm (W) x 165mm (L). Net Weight. 100,000 Hours. Japanese Capacitors. 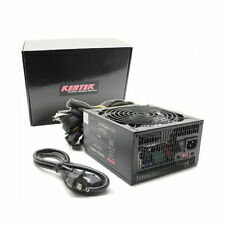 0° to 50° C.
XION POWERREAL ATX POWER SUPPLY 1000 WATT NEW WITH BOX LED FAN DUAL PCI EXPRESS. Shipped with USPS Priority Mail. Compaq server power supply, removed from working environment. Note, all 6 pin pcie also include a 6 to dual 6 2 splitter cable also. Lightly used HP Eliteone 800 G1 power supply. Pulled out of a working HP Eliteone 800 G1 computer. Needed the CPU and Motherboard for upgrading a different computer. During past 6 months. During past year. - Mother Board Connector - Internal 140mm ball-bearing fan. Current 25A 28A 28A 25A 0.5A 2.0A. Form Factor. A fully modular design reduces case clutter and 100% Japanese Capacitors ensures that only the absolute best components are used. The EVGA SuperNOVA 1600 T2 is the ultimate tool to eliminate all system bottlenecks and achieve unrivaled performance. Used 240 watt HP power supply. Tested and works great. Corsair HXi Series Hx1050 1050 Watt Fully Modular Power Supply. Condition is Used. Shipped with USPS Priority Mail. (1) EVGA Manual. (1) 20 4-Pin ATX Cable. (1) Molex to FDD Adapter. (1) 3 Molex Cable. (3) 4 SATA Cables. (4) 2 x 8(6 2)-Pin PCI-E VGA Cables. Neutral 1 4 6. EXCELLENT SERVICE. Item as described. Great price. Item as described. tadiran-rodgers ( 1468. Positive 78 594 1180. ) During past month. Used, ware on labels. Dusty. Works perfectly. AcBel 250Watt Power Supply PC6036 0XW604 TESTED. Condition is Used. Shipped with USPS Priority Mail. Pulled directly from working Alienware Aurora R4 Gaming PCs. Specifications (as listed on EVGA site). Total 750W @ 50C. Modular Cable Type Full. AC Input 100 - 240 VAC, 10A, 50 - 60 Hz. 24 Pin ATX 1x. Japanese Capacitors 100%. AC Power 1x 1500mm (m). 100W 748.8W 12.5W 6W. Asus AcBel PC9045-ZA1G 310W ATX Power Supply Unit 20-Pin, SATA and IDE. Condition is Used. Shipped with USPS Priority Mail. Supports 6pin OR 8pin PCIe video cards. supports 4pin OR 8pin. SHARK TECHNOLOGY. Since the fan is situation inside the system, and not at the back of the PC system, audible fan noise is greatly reduced. Perfect condition! Purchased new few months ago. 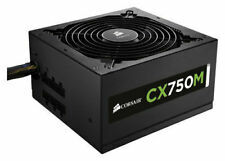 Will come with power cable for graphics card power etc CORSAIR CXM series CX850M 850W PERFECT WORKING ORDER. Condition is Used. Shipped with USPS Priority Mail. Rosewill power supply 80 PLUS GOLD 450W. Condition is Used. Shipped with USPS Priority Mail. 100% functional. All Modular Cables included. No Original Box. May show signs of use, (Scuffs, scratches, dings, dust, etc.). Back to Top. We are sure the problem can be resolved ! Local Pick Up: Pick up is available! CORSAIR CMPSU-550VX 550W ATX Power Supply. OEM Bestec ATX Desktop Tower Computer 250W Power Supply ATX-250-12Z. Condition is Used. Shipped with USPS Priority Mail. High quality with no visible heat shrink tubing. 1x 20 4-pin ATX Cable. 2 x 6 2pin PCIe VGA Cable. 4 x 6 2pin 6 2pin PCIe VGA Cables. 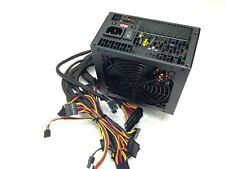 New ListingG.Skill RIPJAWS PS850P 850 Watt 80 Plus Platinum ATX Power Supply TESTED!!! ATX Compliance. ATX Connector. ATX 12V Connector. These power supplies have all been opened and tested to ensure functionality and quality. They are in near new condition. 80 PLUS Platinum Certified. It includes these output connectors: 24(20 4)pin x 1, P4-12V 4pin x 1, SATA II 15pin x 2, and FDD 4pin x 1. 0° C ~ 50° C on Output Load ;. Max Output Power 220 Watt. MTBF 100,000 Hours on Maximum Load at 25°C. MTBF 100,000 Hours on Maximum Load at 25°C. Output Power 350 Watts. AT Push Button 4pin x 1. Current 30A 0.5A 14A 0.5A. MODEL# KDM-X8350 (AT). AT P8/P9 6 6pin x 1.